Tallman Overhead Gun Rack for UTV's with 28"-35" Rollbar Depth. 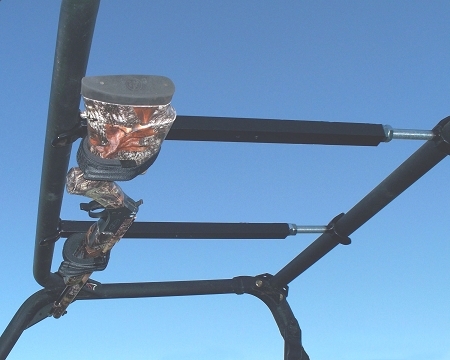 Tall hunters, here is a UTV gun rack designed especially for you. The cradle for a single gun is positioned at the very front of the upper part of the UTV cab---providing ample head room. The Tallman Overhead Gun Rack incorporates the same installation method as Great Day’s popular QuickDraw Overhead Gun Rack. It installs instantly using “opposing forces” technology that eliminates any need for drilling or alterations to the frame of the vehicle. The holding cradles feature super-soft foam inserts and Velcro fasteners. The Tallman Gun Rack fits most popular makes and brands of UTV’s. The Tallman Overhead Gun Rack weighs only 5.5 lbs and ships by UPS.